Park Vista Community High School is committed to fostering a safe environment, which respects diversity while providing an atmosphere of academic excellence, student involvement, and positive opportunities for all. Course Requests for 2019-2020 Students at Park Vista High School have been afforded the opportunity to attend registration assemblies and will be reviewing their course selections with their school counselors during the month of April. Park Vista students were registered for courses based on teacher recommendations, demonstrated scholastic ability, academic history, and their expressed interests, talents, and goals. Every effort will be made to assure that each student will be scheduled in the most appropriate coursework to meet his or her ability level, interests, and objectives. All students have received recommendations for academic course placement from their subject area teachers, advisement from their school counselor, and consultation from their parent or guardian. Students were directed to select and rank their elective course choices, and every available measure was taken to accommodate these requests according to course availability and scheduling factors. Students who did not complete or submit a course selection sheet were given a schedule designed by their school counselor. Students whose performance on FSA, PERT, or EOC exams is below proficiency levels, as mandated by the State and District, will be placed into the required remediation or intensive coursework. Once schedules are created this summer, changes will only be made for the circumstances below: 1. Student is enrolled into a course for which they have already earned credit, or for which they are concurrently enrolled in and near conclusion in for virtual school or credit lab. Rule exclusion for repeatable courses (i.e. PE or intensive coursework). 2. Student is in the wrong level or is unqualified for the course. This rule excludes courses for which a student applied, such as AP, AICE, or dual enrollment. 3. Student previously failed the same course with the same teacher, as permitted within CSR rules. 4. A grade 12 student needing a course change to meet an outstanding graduation requirement. Under no circumstances will the following schedule changes be permitted: 1. Teacher change except as noted in item 3 above. 2. Period or class hour changes. 3. Any elective course changes. On April 1st each student was given a copy of their requested courses for next year. Please CAREFULLY review their selections for next yearâ&#x20AC;&#x2122;s courses. On Wednesday, May 1st the school store will be sponsoring carnival games during lunch. Students can play a few games to relieve some stress between FSA exams. Cobra merchandise will also be available for sale in the courtyard that day. Parents and students can always order online (http://pvchs.com/students___parents/ school_store) or stop by the main office to see a few samples. PBSO Wants Students to Know They Are There for Them! On Friday, March 29, 2019, Mr. Kohlwaies and Mr. Donahue's classes visited PBSO District 6 substation. During their visit, the students interacted with a search and rescue dog; flew a drone; viewed interrogation rooms and spoke to detectives from property crimes; heard a presentation on crime prevention; and had a question and answer session with SWAT and viewed the gadgets they use in the field. Afterward PBSO treated the students to pizza and soft drinks. This was a great opportunity for the ESE students to learn about law enforcement and all the different responsibilities they have in the community. School News Faith Southwick: First Student in PV’s History to Earn Appointment to U.S. Naval Academy When you meet Senior Faith Southwick, you notice immediately that she is ready to take on the world. She is articulate and has a very clear vision of where she wants to be in her career. She discovered the idea as a freshmen sitting with her guidance counselor, Mr. Dewalt and by her junior year she was focused on the Navy. She initially wanted to major in journalism with a focus or reporting on military events. Through her AICE and math teachers she discovered STEM and switched her focus from writing to technology. She worked very hard throughout high school. She’s a member of the band, National Honor Society, Math, Spanish, and Science Honor Societies, Rho Kappa, and co-founder of our Music Honor Society. Through organizations like Leadership Grow Palm Beach County, she learned to network with people who could help her meet her goal. She met with politicians and impressed Representative Lois Frankel who nominated her for appointment to the Naval Academy. Faith believes in the phrase “It takes a Village” as she recognizes the numerous people who have helped her thus far. She’s at the gym at 5 a.m. most mornings with her neighbor getting in shape as she leaves for Induction Day, June 27th. She already spent a weekend with other candidates at the Annapolis campus and she said, “It felt like home”. She will spend four years in the Naval Academy and then enter the service as a Navy Officer. This appointment is equivalent to receiving a full scholarship at an Ivy League school which is similar to $500,000. She is required to be in the service for five years but she knows she wants to make it her life career. She plans to focus on Naval Warfare combining her interest in Engineering and computers. Park Vista is proud of this young lady. Congratulations Faith! Have you decided how you are going to spend your summer? Have you considered the possibility of participating in a summer program? Not only are these programs an exciting way to spend your summer, but you’ll get to experience life on a college campus, list it on your resume, explore new and exciting fields you may want to pursue as a college major, make new friends with students from around the world and possibly earn college credit. A wide variety of summer pre-college and enrichment programs are available for review on the Park Vista Website. Please follow this link for more information about the many summer programs available to our students: http:// pvchs.com/students___parents/counseling_department/ summer_programs___fau_pine_jog. Scholarships Have you considered how you are going to pay for college? Park Vista High School has many resources that may help you cut down on college costs. 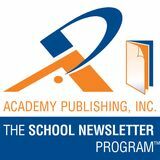 The Scholarship Bulletin is updated every two weeks throughout the school year until May. 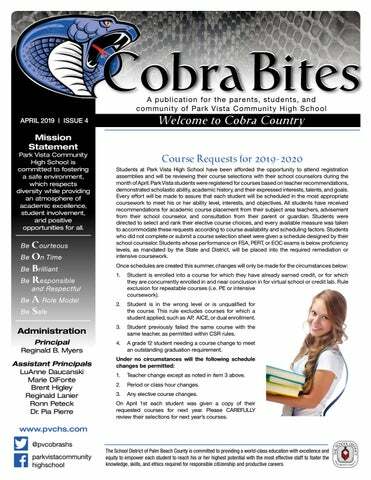 The bulletin is available as a hard copy in the School Counseling office and also at www.pvchs.com under the “School Counseling” tab and then under “Scholarships”. Sign up on www.fastweb.com and www.cappex.com to have scholarship applications emailed directly to you. You will build a profile on these websites and they will match you to scholarships. For students, we also host Scholarship Thursdays throughout the year, once or twice a month, in the School Counseling Office during lunch. During Scholarship Thursdays students can ask questions and pick up current scholarship applications that are available. Class of 2020 KEEP AN EYE ON YOUR MAILBOX FOR SENIOR PORTRAIT INFORMATION! Sessions will begin on June 19. Times book quickly, so make sure you make your appointment soon! Students may begin accumulating service hours as early as the summer prior to entry of the 9th grade year. Service should benefit the community at large. Working solely for an individual will not be acceptable. Hours must be documented in writing, with a supervisor’s signature. Parents cannot sign to verify their child’s participation in an activity. Rehearsal time for participation in a fine arts or performing arts program. Practice time for sports and band. Club meetings to organize community service activities. Donating canned goods or items to gain community service hours. For a full list of the community service guidelines and a copy of the current Community Service Log, please see the Park Vista Website under the School Counseling tab. Coffee Talk Onsite Admissions a Huge Success Again This Year Park Vista School Counseling Office was able to arrange for Florida International University, Florida Atlantic University, Florida Gulf Coast University, and Palm Beach State College to offer onsite admissions to qualified seniors this year. We hope to be able to offer this again next year and expand the number of schools willing to offer this unique and convenient opportunity to our 2020 seniors! THU., MAY 9TH, 8:00 A.M. How to Search for Colleges and How to Apply Hear from one of our resident experts on college selection and the process of applying to colleges. This process can seem like an overwhelming task. This is the perfect opportunity to gain insight into the process to better assist your child. Guidance Keep Up With the Latest School Counseling News! Park Vista School Counselors invite you to receive information via texts! Text @pvguidance to 81010 in order to receive important information regarding scholarships, college visits, summer programs, financial aid, etc... You can also follow us on Twitter at @ PVCHSGuidance. Check our updated SCHOOL COUNSELING website by going to www.pvchs.com and clicking on SCHOOL COUNSELING. Reminder Current 11th grade students going into 12th – you must complete your online class and 20 community service hours before purchasing a parking decal and participating in some school activities during your senior year! Current 10th grade students going into 11th – you must have completed 20 community service hours before purchasing a parking decal and participating in some school activities during your junior year! Taking an Online Course is a Requirement for Graduation! Go to www.FLVS.net to create an account and register for a class. Your school counselor approves online classes daily, even in the summer. Once you register for the class check the FLVS.net website for a welcome message from a teacher to begin the class. If the class is a single segment (semester) class (i.e. Driver’s Ed, Parenting Skills, Social Media, etc.) this will complete your requirement. If the class is a full year 2 segment (semester) course (i.e. English, Spanish, Algebra, etc. ), you must take both semesters on the computer to complete your requirement. Your School Counselor approves on-line courses daily. Continue to check the FLVS website. You will be notified by FLVS when your course has been assigned and you are able to begin the class. This may take a few days to a few weeks. The following semester courses are good choices for students to fulfill this obligation: • Driver’s Education • Career Research and Decision Making • Peer Counseling • Personal and Family Finance • Parenting Skills • Social Media • Outdoor Education. Summer Classes on Virtual School If your child is planning to register and complete an online course through virtual school this summer, our advice is to register NOW and ask for a start date of June 3rd. School counselors approve FLVS requests each working day and continue to do so throughout the summer. Virtual Classes for Next School Year If you and your child chose to enroll in a virtual class, either on campus or off campus, beginning in August, we recommend they register early in the summer and ask for a start date of August 6th. This date is one week before school begins. Students should be active and working (shown as an “A” for their status on FLVS) in the online class on the first day of school. Note: 9:40 a.m. Tuesday - Thursday a five minute warning bell will ring each day for students to report to class. School buses will pick up utilizing their regular scheduled times. Park Vista offers options for students to retake a courses where they earned a “D” or an “F” and for students who need to improve their grade point averages. Students can retake the course in their regular schedule, in virtual school or in a credit recovery program on campus during the day. Students may repeat a course for grade forgiveness if they received a “D” or “F” in a course. Forgiveness for required courses shall be limited to replacing a “D” or “F” with a grade of “C” or higher, earned subsequently in the same or comparable course. A course is forgiven only if a student receives a grade of “C” or higher. Middle school students may replace a grade of “C”, “D”, or “F” with a grade of “C” or higher, earned subsequently in the same or comparable course. Students earning a grade of “D” on the repeat effort, earn credit for that course; however, the initial failing grade is not forgiven. Students may again choose to repeat the same course, and upon earning a grade of “C” or higher, all earlier grades will be forgiven. In all cases of grade forgiveness, only the new grade, of “C” or higher, shall be used in the calculation of the student’s grade point average. Any course grade not replaced according to a District School Board forgiveness policy shall be included in the calculation of the cumulative grade point average required for graduation. In all cases where courses are forgiven under the provisions above, the initial “F” or “D” grade(s) will remain as part of the academic history, but will not be calculated in the grade point average. Students should be advised that many universities calculate GPAs based on all courses attempted. Undecided About Your Plans After High School? Go to www.mynextmove.org, then go to ‘tell us what you like to do’, and complete the survey. Participants will find many possible future occupations and career choices based on interests. Park Vista Softball is On FIRE! Park Vista Junior Varsity softball ended their season before Spring Break with a 10-1 record! What a great year for our girls! Our dynamite Varsity Softball team dominated with an 18-1 record. Not only were they undefeated and won the Jupiter Invitation Tournament, they also defeated almost all of their district competitors as well as their county competition. The Cobras are looking forward to the District tournament which begins on April 29th. Come out and support your Varsity Softball team! Bowling Meeting Want to join the bowling team and help us earn another District Championship next year? There will be an informational meeting on Thursday, May 9th in room 10-105 during lunch. Come to find out information about tryouts and dates! Hope to see you there. Please see Coach Lamb in 4-108 with any questions.